The special treats just roll on aboard SeaDream II. Just how good is the service and does everyone really know your name within 24 hours of embarkation? 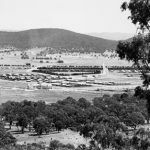 JOHN ROZENTALS experiences a time-warp of Australian political history during a stay in Canberra.